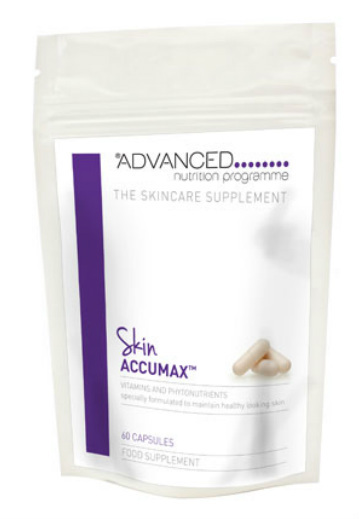 Skin Accumax™ is a skincare supplement from the Advanced Nutrition Programme™ that addresses all levels of problem skin. As it is taken orally it works from the inside,so it benefits the skin over your whole body, not just your face.Skin problems are a reflection of an internal imbalance, so it makes sense to target the source from the inside. How much Skin Accumax™ should I take? Start by taking 4 capsules a day. You can take them all together, but it’s better to spread them out. Always take with a meal. If you forget a dose, you can take it the next time you eat. Although it varies from person to person, many people see results within one or two months. We advise taking Skin Accumax™ for a minimum of 14 weeks. As your skin improves, you may wish to reduce to one or two a day. When you are completely happy you can discontinue altogether. When it comes to healthy skin, what you put inside the body can be as important as what you apply topically. The Advanced Nutrition Programme™ is a cutting edge, salon-only range of supplementsthat supports skincare regimes. These premium nutraceuticals provide the optimum daily amounts of vitamins, minerals and plant extracts to help maintain vibrant health and glowing skin. Only the finest, purest ingredients are used, in a form that is easily absorbed by the body. 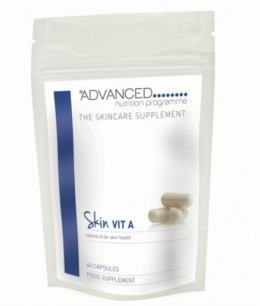 Skin Vitality 2 Designed to promote healthy skin, hair and nails as well as total body wellbeing. Each convenient daily blister strip contains a combination of vitamin and minerals, enhanced with a high powered vitamin C complex, antioxidants, bioflavonoids and essential fatty acids. Skin Omegas A combination of omega 3 and omega 6 fatty acids to support skin hydration and health. Unlike many high street brands, this fish oil is scrupulously screened for pollutants. Skin Pure When you cleanse from within you can restore your skin’s vitality and boost energy too. Skin Pure contains a combination of nutrients aimed at supporting the liver which plays a role in detoxing the body and therefore the skin. Skin Collagen Support Contains vitamins and plant extracts which help provide the building blocks for collagen, leading to plumper, firmer skin. Skin Defender An antioxidant complex to support skin exposed to sunlight. Contains a variety of herbs and plant extracts to nuture a healthy complexion. Skin Vit C This supplement combines vitamin C with calcium and plant extracts to help fight free radicals, while maintaining capillaries and blood vessels. Skin Vitality 1 A complex multivitamin that includes antioxidants, plus plant extracts bilberry and lutein which help to maintain the skin’s connective tissue. A must have for everyone using Environ products. A really effective way to boost your vitamin A.